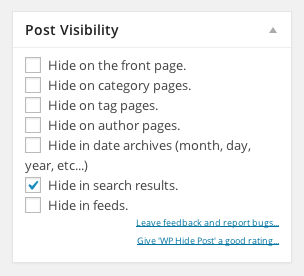 WP Hide Post is a plugin that allows you to (among other things) exclude posts from search results. WP Hide Post hides posts from search results by flagging them with a Custom Field called _wplp_post_search so we need to tell SearchWP to exclude any posts with that meta_key. We’ll do that by using SearchWP’s searchwp_exclude hook and WordPress’ get_posts function to retrieve the IDs of all the posts that have been excluded from search by WP Hide Post. We’ll then send those IDs back to SearchWP and as a result they will be excluded by SearchWP.